Taipei National University of the Arts (TNUA) is the leading art educational institution in Taiwan and is world-renowned for its great performance in the various arts fields. The program that will be presented in the Honolulu Festival has been co-composed by the teachers of the Department of Traditional Music, Department of Dance and Center for Traditional Arts. 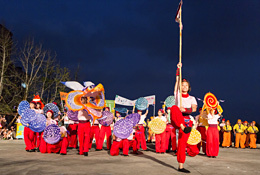 The performers are students, selected through auditions after 4 months of training, and are from various schools in the TNUA, including Music, Fine Arts and Cultural Resources.